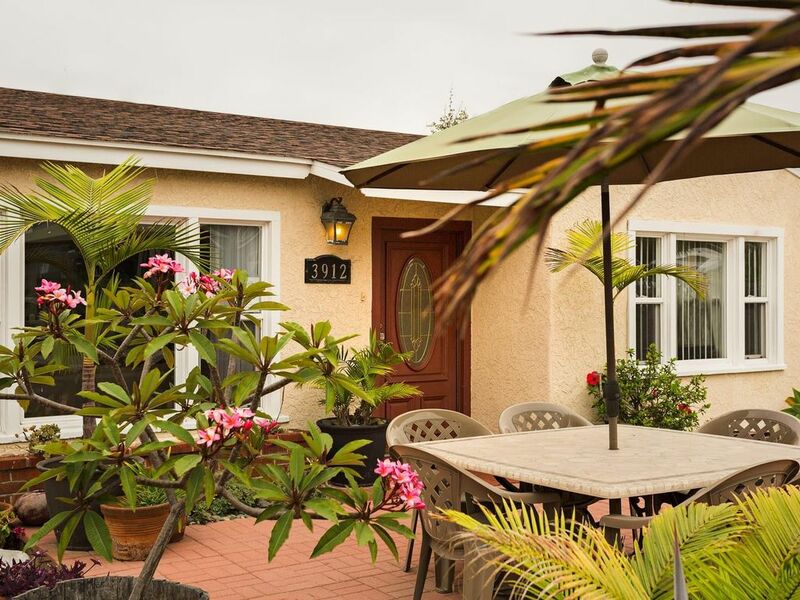 This 2 bedroom classic Carlsbad Beach bungalow has been updated to make your stay very comfortable with the features you want on your vacation. Bedroom 1 has a king bed, TV, and A/C for those rare days when the sea breeze isn't enough. Bedroom 2 has a bunk set-up with a twin over a full. We have a DVD w/movies, and a 50" HD TV for your in-house downtime. Wireless internet access covers the whole house and the front and back patios. Rear patio houses the W/D, a propane fire pit, BBQ, and a table w/chairs & umbrella for ouside entertaining. You will also find the "treasure shed" full of beach gear for your time on the sand. Beach chairs, umbrella, boogie boards, ice chest, beach towels, and a large wagon to haul it all to the water. Our guests love the modern upgrades "Casa Alegre" offers and the location is unbeatable! Time spent here will create memories for a lifetime! We fell in love with the beach life in Carlsbad! After many trips down from Northern California, we decided Carlsbad was the place for us. With a love of the beach and a business focus around real estate, Coastal Casitas was born. We now own or manage a group of interesting beach oriented vacation properties. Coastal Casitas has enjoyed it's success based on personal service and providing clean, honest, vacation rental properties at great prices! When we found "Casa Alegre", it was just the right combination of a beach neighborhood with a local family feel. We liked the location for the ease of visiting the surf and yet a short stroll to the village area. It's the perfect place to stretch out a bit and yet have easy access to all that Carlsbad has to offer. Just 1 block to the surf & sand! This air conditioned classic beach home is set up for a carefree vacation. Enjoy the coastal climate sitting outside, strolling the beach, or take the walk to Carlsbad Village. Outdoor shower provided to clean the sand off. My husband and I loved the property, the location was perfect and it had everything we needed. We brought along our seven month old puppy and she enjoyed the backyard, however she gave us quite a scare when she managed to find the only hole in the fence that was big enough for her. I would recommend bringing your dog, but if it is a small one keep an eye on it (ours is a 19 lb beagle). One other thing that I would have liked is for the outside back gate to have a lock on it. It is not secure and anyone could walk into the backyard. Otherwise it was a great stay and we would use the property again. Loved the house it is in the perfect location! Such a great family get away! Close to the beach and Carlsbad Village! We will definitely be back again! We had a great first stay in Carlsbad at Casa Alegre! House was clean and ready for us upon arrival. One block from the beach and a nice walk down Garfield to downtown Carlsbad. We also used Uber after a long day at the beach to go out downtown with tired kids. It was nice to have a front and backyard to relax from the hustle at the beach. Dinner time was easy with a full kitchen and BBQ right out the back door. Vons and RiteAid are two minutes away for any missed supplies. Debra from Coastal Casitas made sure we had everything we needed throughout the week. I look forward to next year! Thank you Coastal Casitas! Easy access to beach, freeway, shopping and dining. Nice quiet neighborhood. House was clean, well-supplied and comfortable. Only downside was reserved parking restricted to one space and other public parking was very limited, especially with the tenant living in adjoining garage turned rental was storing his junk car in front of house. Other than that Gary made himself very accessible should have we needed him. Stayed the weekend and everything was an A+. Older home but very well maintained and close to everything . Only draw back is that drivers speed up and down this street so I would not recommend this property for families with young children. Everything else was awesome and would stay here again. This was our first VRBO rental and it was great. The house was clean, well supplied and there was a small backyard. It is convinient to the beach, downtown and ANA. Gary made it easy to rent and to check-in also he also checked during our stay to see if we needed anything. I will rent it again.